Cliff Cardinal's Huff touches on solvent abuse, sexual abuse, suicide and the bleak despair of being poor, isolated and feeling irrelevant. It's not breezy theatre, but it is riveting. Breathing is one of those things we often take for granted. But try living without it. We can't, of course. Breath is life. Though if you were to breathe in the breath you've exhaled — by, say, putting a plastic bag over your head — you'd pretty quickly expire. And that's where writer/performer Cliff Cardinal's extraordinary solo play Huff begins. Our central character, Wind, has taped a bag over his head and his hands behind his back. There's a genuine tension for the audience as we watch him breathe in and out, see the bag expand and contract and fog up, and we wait for him to take it off. If that's not the sort of tension you enjoy in your theatre, Huff may not be for you, because things don't get a lot more comfortable over the next 70 minutes. Huff begins with our main character, Wind, with a bag over his head and his hands taped behind his back. The tension created doesn't let up over the play's 70 minutes. (akipari)Following Wind and his brothers and their life on the rez, Huff touches on all that's toxic in their world — solvent abuse, sexual abuse, suicide and the bleak despair of being poor and isolated and feeling irrelevant. A light breeze of a play this is not. But it is riveting. 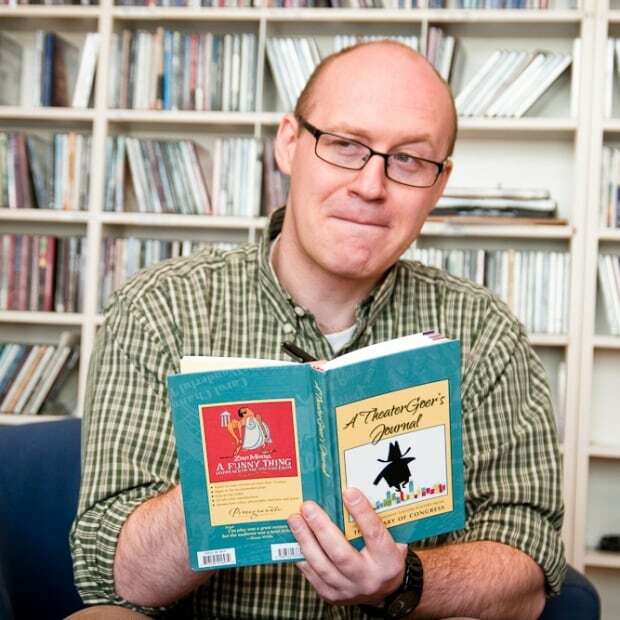 Both Cardinal's script and his performance have only gotten better since his acclaimed performance of the show at the Winnipeg Fringe back in 2012. 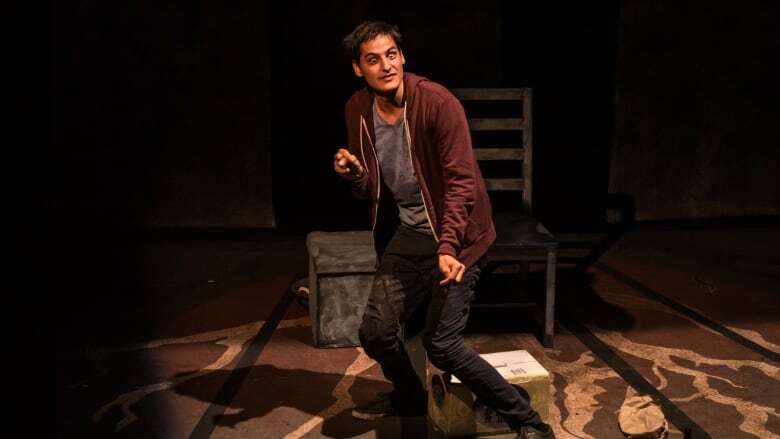 He's toured it across the country since, and it shows in director Karin Randoja's production for Toronto's Native Earth, presented locally by Theatre Projects Manitoba. The script is taut and honed, without a wasted scene or line. It's densely packed with ideas — without being didactic, it touches on issues of poverty, colonialism and the historic and systemic injustices that too often leave Indigenous Canadians living in appalling conditions. Playing everyone from Wind to an aggressive skunk, Cliff Cardinal delivers distinct characters in an intensely energetic performance. (akipari)Playing everyone from Wind to his sweetly innocent younger brother to their FASD-damaged older brother Charles to their abusive father to a foul-mouthed and particularly aggressive skunk, Cardinal delivers distinct characters in an intensely energetic performance. The characters are often also very funny, and Cardinal does cut the darkness of Wind's story with flashes of humour — usually still dark comedy, but enough to offer some brief respite from the real darkness. And Huff is fearless in exploring those dark places, challenging us as an audience to follow. Those who do are rewarded — Huff ends with the faintest glimmer of hope, a door opened just a crack to let the light in. Go, and breathe it in. Huff is remarkable theatre. 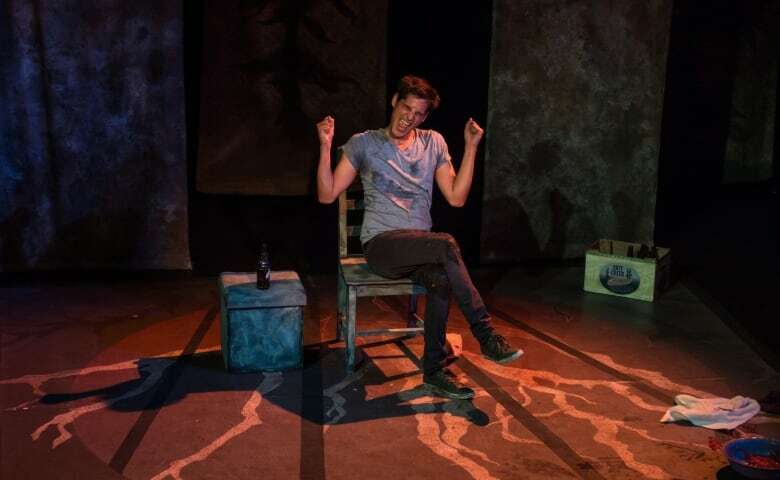 Theatre Projects Manitoba's production of Huff runs at the Rachel Browne Theatre until Feb. 26. 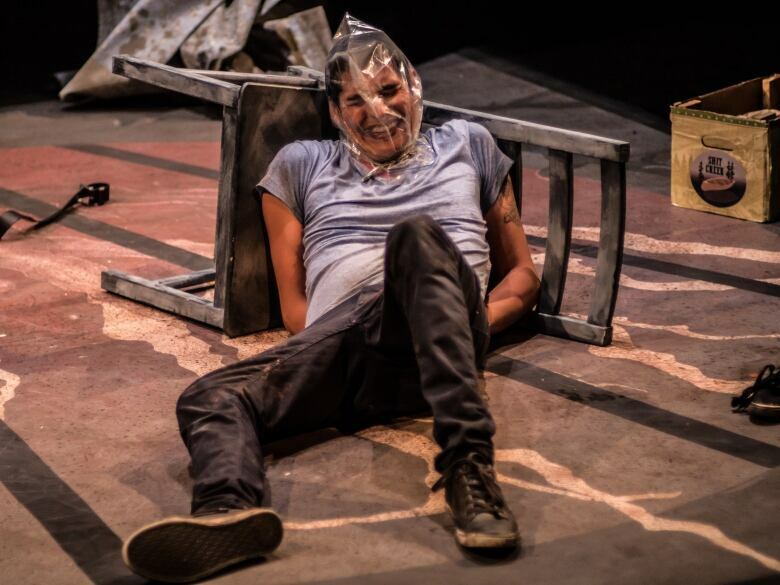 Huff playwright Cliff Cardinal on solvent abuse: "a scary subculture that nobody wants to talk about"